HD Supply is one of the largest industrial distributors in North America. The company provides a broad range of products and value-add services to approximately 500,000 customers with leadership positions in maintenance, repair and operations, infrastructure and power, and specialty construction sectors. Through approximately 650 locations across 48 states and seven Canadian provinces, the company's approximately 15,000 associates provide localized, customer-driven services including jobsite delivery, will call or direct-ship options, diversified logistics, and innovative solutions that contribute to its customers' success. Learn more at: hdsupply.com. New Sales Hires at HD Supply may have previous industry selling experience, but they do not know how to navigate the organization of HD Supply in an efficient manner. This can result in making fewer sales calls and struggling to reach sales goals. There is no centralized way to communicate key product knowledge across a vertical. Many New Sales Hires do not have the experienced eyes of a seasoned veteran and are not able to spot sales opportunities when they are at a customer’s site. They lack the ability to differentiate between the features and benefits of products and the ability to introduce the products into a conversation with a customer in a consultative manner. 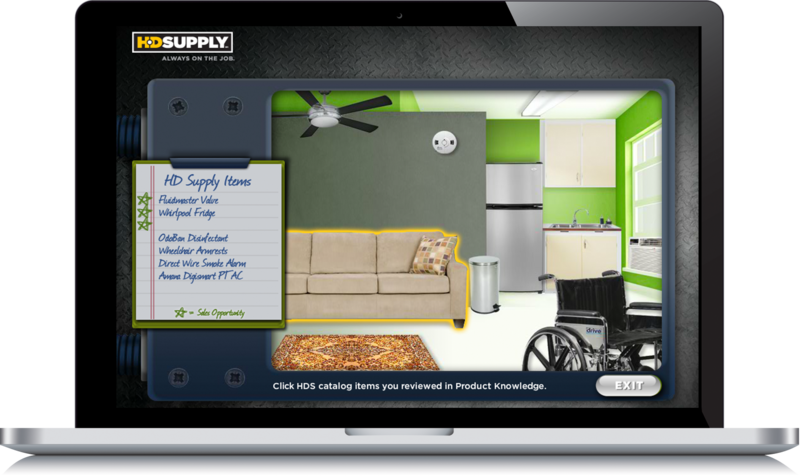 Allen Interactions partnered with HD Supply to create a web-based, elearning sales course for New Hires focused on three areas of interactive practice. Feature vs. Benefit product knowledge drill-and-practice. “Week in the Life” sales scenarios.